Throwing a pink velvet bow on it pretty much ensures you’re V-Day-Ready. 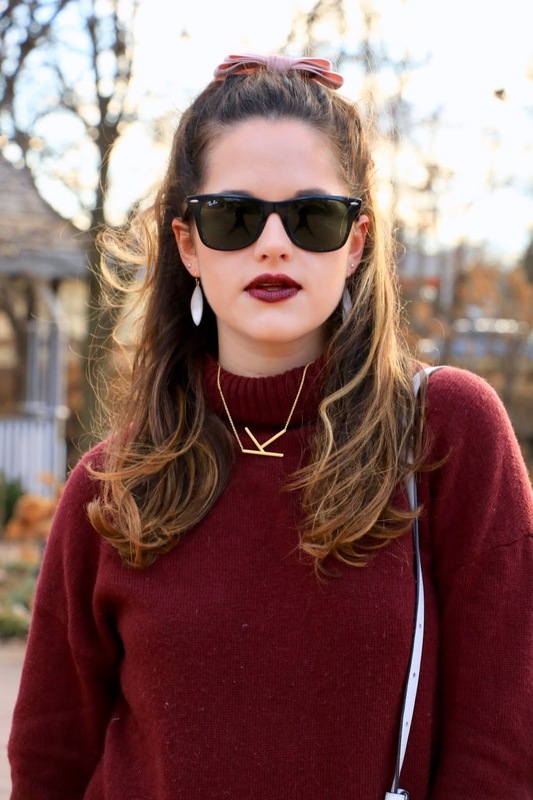 Here, I added a hair bow to my burgundy-sweater look, and applied a sultry lip to match. Meanwhile, there’s a whole party happening on my lower half. These leopard pants have been one of my favorite pieces to style recently, and I’ve been rocking them with everything from graphic tees to crisp blazers to simple sweaters like this one. Especially for this gloomy time of year, they’re a MUCH needed fresh alternative to denim or black pants. Tip: Use white accessories to help brighten up even your winteriest winter looks. From my boots to my earrings to my purse, the bright, neutral hue instantly transports me to warmer days and creates a modern, elevated aesthetic. Even my nails are white! The biting-cold temps that have been plaguing the nation are no joke. While we haven’t been hit with a polar vortex here in NYC, it’s safe to say we’ve ALL been bundling up more than usual lately. For extra warmth, I’ve been adding unexpected layers to my daily outfit formulas — a cami under a blouse, a thin tee under a sweater, and even tights under jeans. In the above photos, I’m actually wearing a relatively thick shell underneath my sweater, which did wonders for keeping the cold air at bay. At this point, the more layers the better, and I love sneaking in a few hidden ones that don’t compete with my overall look!